When Tommy Was 18 Attending Rutgers University In New Jersey He Got His 1st Taste Of The Restaurant Industry As He Worked His Way Up Through The Ranks. After College He Moved To Maryland Where He Went To Work Honing His Skills At Several Popular Restaurants Such As Fritallis, Fisherman Warf, & TGI Fridays. Tommy Found His True Passion for the Industry at His Family Owned Restaurant Victor’s Place. It Was Here Where He Worked Alongside His Brothers Learning The Art Of True Hospitality And Watching The Smile On His Customer’s Faces As They Enjoyed The Food And Service He Wanted To Become Known For. 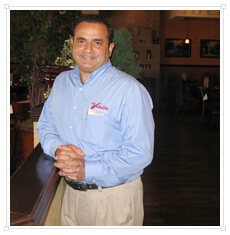 A 20 Year Veteran of the Food-Service Business, Khatib Arrived In Orlando 7 Years Ago. After Moving To Florida He Went To Work In The Busy Downtown For Café Ritazza Taking Care Of The Local Downtown Patrons. Khatib Got The Daily Scuttlebutt On Happenings Downtown From His Legions Of Loyal Patrons Who Would Drop In For Breakfast Or Lunch. The Cliental Was A Diverse Bunch, Ranging From City Leaders And NBA Stars To Busy Workers Replenishing Their Energy Reserves From The 50-Item Menu, Created Mostly By Tommy Khatib. Now Tommy Joins the Ranks in Yet another Italian Venture at Vinito’s Ristorante, Where He Brings with Him His Big City Charm to Our Local and International Guests. He Feels Right At Home Working Alongside Chef Rafaela Marsilio And Joseph Palladino. Whether In The Main Dining Room, Or The Rustic Kitchen Tommy Enjoys Bringing The Very Best Orlando Has To Offer To Each And Every Guest That Walks Through The Door. Copyright © 2017 www.vinitousa.com. All rights reserved.